I had the good fortune to moderate a panel discussion in New York recently in which several legal marketers and I discussed the common disconnect in law firms between lawyers and marketers. The usual version of this discussion includes a review of Myers-Briggs or Neuro-linguistic programming concepts to help clarify the differences in how lawyers and marketers think, process information, make decisions and communicate. This is an important step in the learning process and if you haven't spent time understanding that the way you think and act isn't necessarily how your colleagues or clients think and act, it's time well spent. This classic Far Side comic artfully explains how at times lawyers and marketers simply cannot understand each other. Our panel, led by our energetic organizer Christa Crane of Freshfields, chose to take a slightly different approach. We highlighted specific examples where marketers used data to drive decisions, obtain approval for solid marketing ideas or even gently reject a lawyer's pet project (like sponsoring that 5k run in the lawyer's hometown!). We felt the case studies would serve a dual purpose: provide specific techniques that other marketers can employ -- events planners would learn some tips on event planning, for example -- and also provide an approach that could be adapted in other functions -- maybe a CRM technologist could translate some techniques that worked in the launch of a website. My fellow panelists are accomplished legal marketers, and each has had plenty of experiences from which to draw in order to illustrate their points. Sandi Sonnenfeld of Pillsbury discussed the interpretive skills needed when engaging a lawyer in a discussion of Public Relations. "The client won't want us to publicize this" often means "I'm not comfortable asking" for example. Alison Gordon of Bryan Cave discussed the firm's financial dashboard which provides helpful insights into a lawyer's new business production, data that can be very helpful in identifying which marketing efforts may be most impactful for a specific lawyer. Ginger Donnan of Ginger Donnan Events provided a detailed events planning blueprint with accompanying procedures and guidelines to ensure that marketing events generate a definable return on investment. Linda Sparn of Schulte Roth provided a roadmap to securing technology investment by quantifying the impact of efficiency. In one example, she presented how electronic media tracking tools from Concep can identify which publications and newsletters generate the greatest reader interest. Rely on facts, not beliefs or aspirations. As marketers we tend to chafe when faced with what appears to be a poor idea. "Let's launch a new monthly newsletter to provide updates on recent trends in this industry." We may have tried this 12 times previously, only to learn that only once out of twelve times did we actually publish more than 10 issues; in only 5 of the 12 attempts did we reach more than 500 readers; and the total of all click-throughs to our website from all published articles on this topic was 14. But simply stating, "That's a bad idea" isn't enough. Lawyers will more readily adjust their expectations when faced with data that supports, or fails to support, their ideas. When selling an idea, assume no prior knowledge. If we're proposing an idea to the firm's lawyers, it's helpful to assume they aren't as well-versed in the details as we are. Professional salespeople make this mistake all the time by assuming their audience has a similar knowledge base: "You know product X from BigCo? Well, our product is like that but it offers many more features." Rather than assume the lawyer knows the details, gracefully and quickly refresh the details for him. When buying an idea, assume no prior knowledge. As marketers, we fail to heed our own counsel at times. When the lawyer suggests an idea we've tried before, we often leap to the conclusion that it won't work the next time. However, our decisions should be based on sound analysis of the current data. Sometimes the circumstances that led an event failure last time may be different this time. Or maybe the directory that was a lousy investment last year shouldn't prevent us from investing in a more targeted one this year. Offer alternative approaches, not just yes or no. We are all passionate about our ideas, but if we present only a single option because we can't possibly reduce the scope, we may receive a flat-out rejection. Much like the aggrieved author who endures the editor's redlining, we should be prepared to offer alternatives rather than simply walk away defeated. Maybe we can start with a pilot of the new software before investing in a firm-wide license. Maybe we can test the new initiative with one practice group or office before rolling it out across the firm. Success breeds success, and credibility. 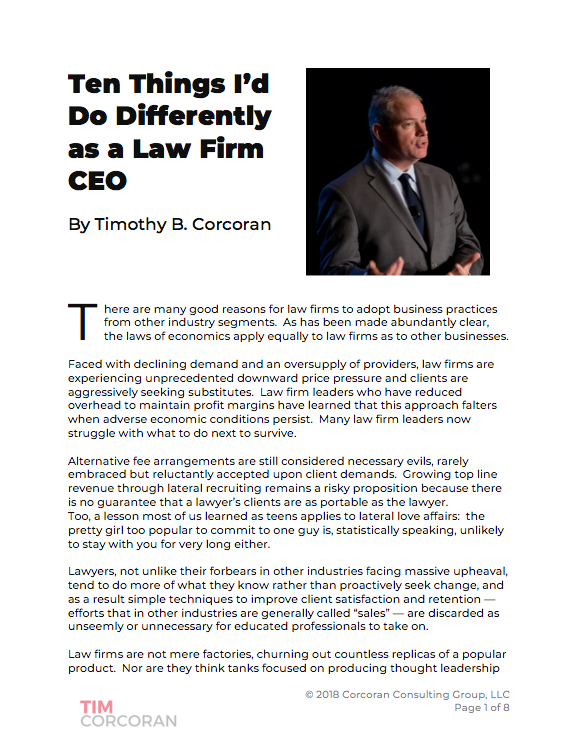 In a law firm setting, nothing generates attention more than success. If we've been successful in investing the firm's capital and achieving a notable return, let's share that success story. Tally up a few successes, and the next time we present an idea that may not be fully formed, we may get the benefit of the doubt that we know what we're talking about, and that we're good stewards of the partners' capital. Publicize successes and how you got there. But it's not enough to merely broadcast the success. Show how the sausage was made! It can be very impactful to point out that the success of our beauty contest was due not to fairy dust and our fine pedigree, but to proper planning, the input of several practices, up-front research into client needs and several rehearsals before our presentation. We want to reinforce the message that replicating the success requires replicating the process. There were many other fine ideas presented. We've been invited to add to these, incorporate a multitude of new suggestions, and deliver an encore presentation of the program for an upcoming webinar for the legal marketing community. Stay tuned!